The Bengal Secretariat Book Depot. The Report has been compiled by Babu Mallinath Ray, Sub-Deputy Collector, 24-Parganas, principally on the basis of the materials obtained from the reports of the districts of Patna and 24-Parganas. 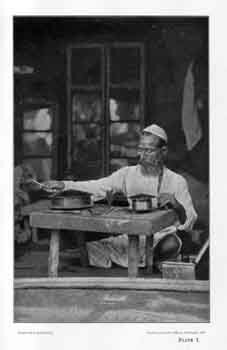 Babu Mallinath Ray has also prepared the photo plates illustrating the manufacture of the articles. No definite information regarding the early history of the industry is available, but it is certain that this industry has been in existence in India from very ancient times. There is a legend amongst the Wire and tinsel workers of Patna and Calcutta that Joseph, son of Jacob, was the inventor of this industry. He was, so runs the legend, in the habit of spending his leisure hours in embroidering handkerchiefs with tinsel and wire. To this day the novice offers niaz (offerings) to the memory of Joseph when he begins to learn the art and all persons engaged in the industry offer niazto his memory on the last Wednesday of the Muhammadan year. The antiquity of the industry may be gathered from the old Hindu epic Ramayan.Therein we learn that Sita on the occasion of her marriage with Rama was dressed in a rose pink sari richly embroidered with gold. There is a record of the industry having been known to the world at the time of the siege of Troy, and there is mention of the Egyptian mummies having been found wrapped in garments wrought with thin strips of gold. There is no doubt that the Hindu Rajas of the prehistoric period used apparels set with gold, but it is doubtful whether the "tinsel industry" proper was known to them before the Muhammadan period. This much is certain that the industry flourished in towns which were ancient Muhammadan capitals and even now it is generally in the hands of the Muhammadans. A request to a tarkish (wire-drawer) to show his tools is generally answered by the production of a small rude table, one or two reels a pair of scissors, a small hammer, a pair of forceps and a few pieces of scrap iron. Technical skill is by no means wanting, and it is often astonishing to see how those men, working with simple and crude tools in little huts, turn out articles of high polish and extreme fineness. Some of the plates give us the idea of those used in Calcutta. Wires used in this industry are made of silver; the yellow ones are those coated with gold. The yellow of gold is obtained by getting a silver bar coated with a layer of gold in the following manner. 40 to 60 tolasof silver (1 tola=180 grains) are first melted and moulded into a bar tapering at one end to the shape of a candle. The bar is next wrapped up with very thin gold leaves and tied over firmly with silk threads. Then the bar is gradually heated on the fire till the gold leaves lie firmly on the silver bar. Gold weighing annas 10 to 12 (one anna=ll.25 grains) is generally used for coating a silver bar weighing 40 to 60 tolas. The quantity of gold used varies with the colour and quality of the tinsel ultimately required. If but little gold is put on, the tinsel will be of pale yellowish colour; if a large quantity, it will be of rich gold red. 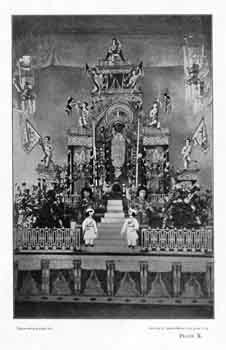 The bar thus prepared is technically called passa or kandla and the class of men who prepared kandlas are called kandla kush. Copper coated with silver is often used and the articles made of it are called jhuta or false; whereas those made of silver alone are called sachha or pure. thinness of a wire of a very narrow gauge. The wire thus obtained is coiled round a reel about three inches in diameter shaped like an ordinary reel of thread, technically known as pairee, which is fixed at one end of a small table about a foot high by a spike running through the centre (Plate I): at the other end of the table is similarly fixed a larger reel about 6 inches in diameter. This is called paira. At the middle of the table is fixed firmly by means of wedges driven into notches in the table a steel plate called jantar or jantri having graduated holes. 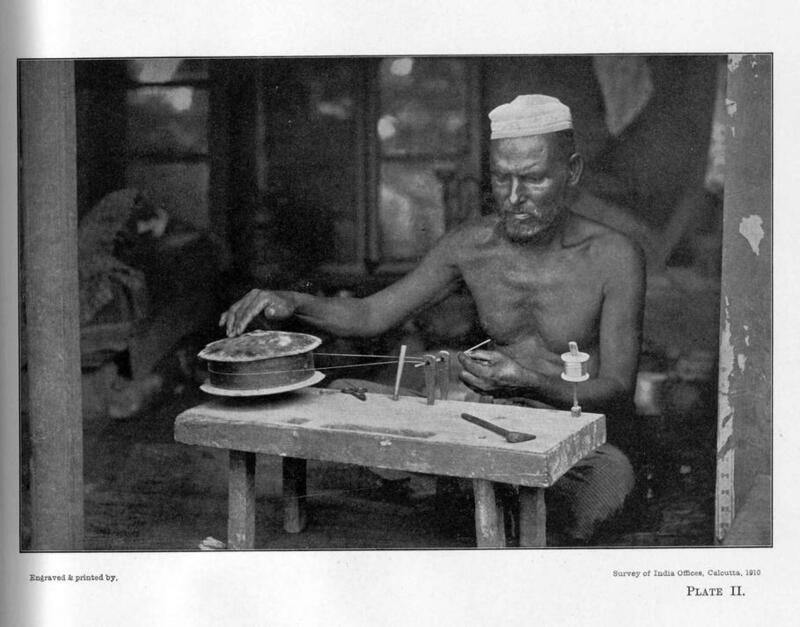 One end of the wire coiled on the pairee is filed down and laid through a hole in the jantar and fastened to a hole on the upper edge of the paira. The paira is then turned round by an iron rod, and a wire of the desired thinness is coiled on it by being led through a graduated hole. To obtain a still thinner wire, the wire obtained as above is coiled back on the pairee and led through a narrower hole in the jantar. By repeating the process described above, a wire of any desired thinness is obtained. Wires as fine as hair may be drawn by this process. Usually a tola of a metal is drawn into 600 to 1,200 yards of wire. The gold or silver coating becomes closely fixed by means of this process; and the wire has the appearance of bright gold or silver. The Jantar - In Patna the steel plate or jantar is now practically ousted from the market by the introduction of European-made gold plated discs about an inch in diameter and of the thickness of a rupee, having a series of holes, each succeeding hole being narrower and finer than the one before. The principle of working is the same; the difference merely being the replacement of a rude but cheap implement by a costly but neat one. 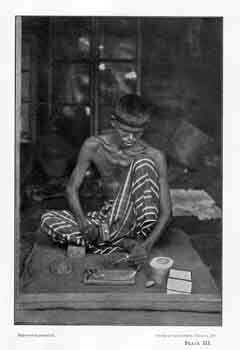 The Calcutta people do not use the European jantar. They prefer their native tools. (a) Kora salma or coiled round wire. (b) Dobka salma or coiled flat wire. Kora salma, is described below. Dobka salma will be described later on with badla from which it is prepared. At one end of a small table a wheel is fixed. A few inches away through holes in two pegs an iron rod is fixed horizontally. Another round iron spindle is joined at one end with the rod by a piece of bamboo, the other end being free. At the other end of the table is fixed a reel of gold or silver wire. The wheel is then joined with the iron rod by means of a string. When the wheel is turned, this rod is set on rapid motion. The spindle to which it is joined by an end of the wire from the reel, is also set in motion; and thus the wire is coiled round the spindle, being guided by the fingers of the workman. Thus a salma of any length is made. By changing the iron spindle mentioned above salmas of different fineness are obtained. Plate No. II is an illustration of this apparatus. The fine wire described above is flattened in an extremely delicate and skilful manner. The workman, seated before a small and highly polished steel anvil, about 2 inches broad with a steel plate in which there are two or three holes set opposite to him and perpendicular to the anvil, draws through these holes as many wires, two or three as it may be  by a motion of the index finger and the thumb of his left hand, striking them rapidly but firmly with a steel hammer, the face of which is also polished like that of the anvil. This flattens the wire perfectly; and such is the skill of manipulation, that no portion of the wires escapes the blow of the hammer, the action of drawing the wire, rapid as it is, being adjusted to the length which will be covered by the face of the hammer in its descent. No system of rollers or other machinery could perfectly ensure the same effect, whether of extreme thinness of the flattened wire, or its softness and ductility." (a) Dewali  Somewhat broad. (b) Kasore  Thin and light. (c) Kamdani  For stitching on linen or silk. (1) Dobka  Salma or coiled flat wire. (2) Kankni or pearl wire. Dobka salma is prepared in the same way as the kora salma; the only difference is that the gold or silver wire is not round but flat. Preparation of kanki is similar, but the spindle used for this is not a round one but triangular or rectangular according to choice. Bullion is also similarly prepared, but the badla used for this is curved and not a flat one. The curvature is obtained by passing the badla through the hole in a jantar in which a round fine wire is fixed leaving a semi-lunar narrow space. The badla thus obtained is wound on its concave side round the spindle. "The silk is very slightly twisted, and is rolled upon a winder. The end is then passed over a polished steel hook fixed to a beam in the ceiling of the workshop, and to it is suspended a spindle with a long thin bamboo shank, slightly weighed to keep it steady, which nearly touches the floor. The workman gives the shank of the spindle a sharp turn upon his thigh, which sets it spinning with rapidity. The gold wire, which has been wound on a reel as it passes behind the maker, is there applied to the bottom of the silk thread near the spindle and twists itself upwards, being guided by the workmen as high as he can conveniently reach or nearly his own height, upon the thread: but it is impossible to describe in exact terms the curiously dexterous and rapid process of the manipulation. The spindle is then stopped; the thread now covered with wire is wound upon the spindle and fastened in a notch of the shank when the silk thread is drawn down, and the spindle is again set spinning with the same result as before. Certain lengths of the gold thread kallabutton are made in skeins, and so sold or used by weavers." This is very interesting and worthy of notice. A wire is coiled round an iron rod of about 1/12 to 1/16 of an inch in diameter. The coil is then taken out and cut into rings with a pair of scissors. Then one by one they are dropped on a highly polished anvil with the aid of forceps and hammered by a polished hammer. With every stroke of the hammer a chumki is produced. Plate III illustrates the preparation of chumkis. 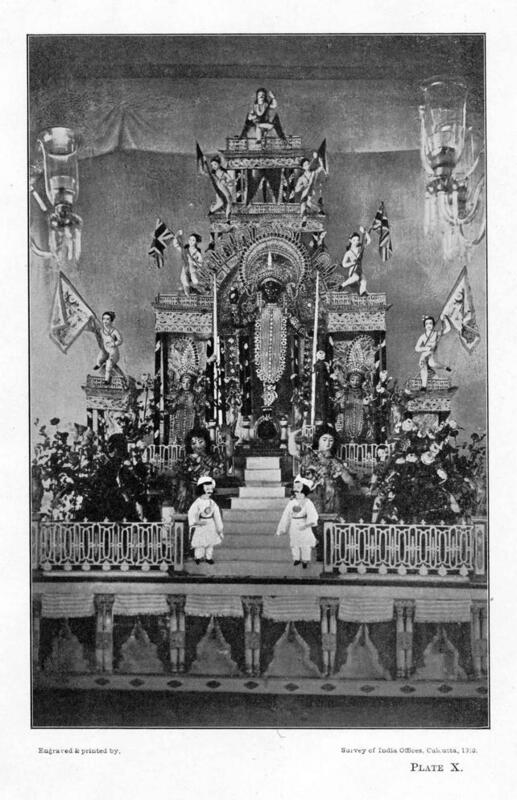 (a) Decorating Hindu idols during the Pujas. (b) Decorating garments, caps, turbans, shoes, etc. (d) Trappings for horses and elephants. In Calcutta itself the dresses for dancing girls and itinerant theatrical players are decorated with wire and tinsel articles. It is impossible to ascertain from what period the images of gods and goddesses of Hindu worship have been decorated with tinsel ornaments. But there is no doubt that the practice has been in vogue for a very long time; for we find the poet Ram Prosad, who lived about 200 years ago, denouncing the tinsel decorations in the following terms:  " The mother (goddess) who adorns the world with gold and gems  shame to you who want to adorn that mother with wire and tinsel." 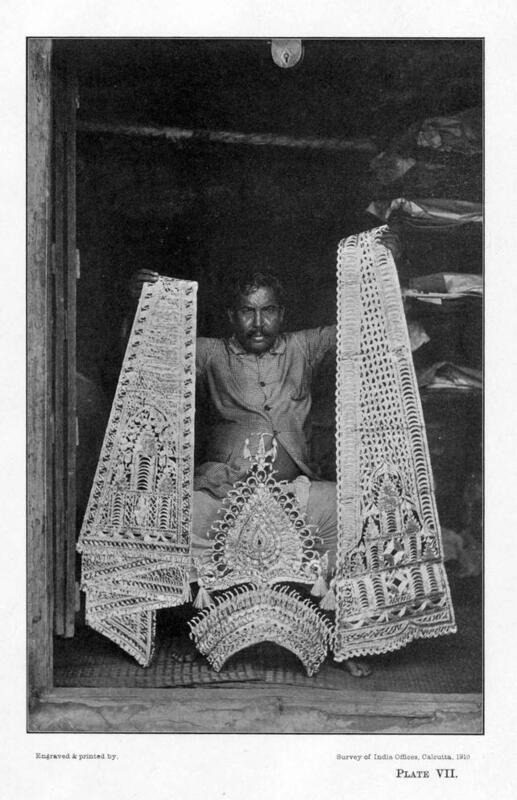 Preparation of tinsel ornaments was the hereditary occupation of a sect of the Hindus called malakars or the garland and pith (sola) decoration-makers. But it has now been taken up by all castes, both men and women. Kumartali and Machuabazar in Calcutta are the centres of this industry, but there is also a shop at Bhawanipur. At each of those two places there are about 10 shops with 125 workmen, besides 300 women helping them in the industry by doing in-door work. The workers are paid by piece-work; each man earns about 4 to 5 annas a day in the slack season and 10 to 12 annas in the busy season, namely, during the Pujas. Almost all the women doing this work are members of middle class Hindu families who devote their leisure hours to this work. There are also some poor women who depend on it for their livelihood, earning daily from 1 1/2 annas to 2 1/2 annas. Krishnagar, Sherpur and Dacca are also the chief centres of manufacture of tinsel ornaments. (1) Decoration of the frame in which the image is put. (2) Preparation of mookoot or tiara or crown. (3) " of anchla or scarf. (4) " of necklace, bajoo or circular ornament worn on the upper arm, bracelet, anklet, etc. The images are set up in a frame which is called marrh. This marrh is covered with thick pieces of tinsels which are highly ornamental, and about a foot or 14 inches in width. Each of these is called a kalka. (1) Kap  thin slices of sola cut out by sharp knife. (2) Paste  prepared with wax and gandha biraj (scented resin). 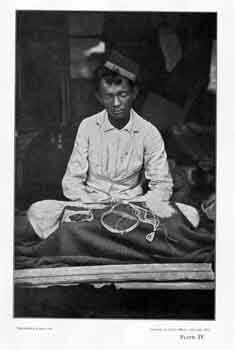 (3) Angti  prepared by coiling lametta round an iron wire by means of a charka. (4) Jamira  thin plates coloured red or green and called "ruby" or "emerald" foil. (7) Bicha chaki  cup shaped spangles prepared from white or ruby foils. The malakars supply the kap to the decorators who, in order to obtain an impression of the design, press it with the foot or elbow on a mould previously made by setting thick cotton thread on a kap with the paste. A mesh work of angtis is then laid on the surface of the kap, and the impression is thus obtained. The kap is then made over to the women workers who cut out some of the interstices by means of naruns which are iron rods about 8 inches long with sharp flattened tips. The opening thus made are then closed with pieces of ruby foils from behind. The interspaces are pasted over with chumkis, bicha chaki, pieces of tale or coloured paper as the case may be. Plates V and VI show the image decorators at work. (1) An iron wire frame. (4) Kirkira, an inch of angti the two ends of which have been tied together by means of a resha or a piece of twisted lametta 1 � inches long. (5) Bakul  an oval piece of pith enriched with lametta. The iron frame is covered with 1ametta and is set with bakul, kirkir, chumki, etc. Plate V illustrates the preparation of a mookoot. The preparation of bracelets, bajoo and necklaces is similar. The frame is made of pith on which is spread gum coloured according to design; and on that foils are pasted. Chumki, salma, kankni, badla and bullion are used in ornamenting garments, caps, turbans, jackets, shoes, belts, etc. Velvet, silk or linen embroidered with them are called zardozi work, and the workers are called Zardoz.Both men and women do this work, each earning eight annas to one rupee per day: Plates VII and IX are illustrations of such work. In Murshidabad and Patna gold and silver embroidery or karchabwork is done with kallabatoon thread. Elephant jheel, horse trappings, canopies with fringes, palanquin covers, gowns, jackets, dresses, bodices, prayer carpets, caps, slippers, money-bags, belts, etc., are embroidered with karchab or karchikan work. Embroidery is either worked in the loom or wrought with the needle. Some of the best embroidery is wrought on a velvet ground or on English broadcloth. The heaviest kind of gold embroidery is called kinkhab. It is done by fixing the fabric to be embroidered on a frame work. The patterns are lightly painted or printed on the fabric with some kind of coloured material; and these patterns the embroiderer follows in laying the kallabatoon thread. Gold and silver embroidery on cotton is called kamdani. Silk fabrics with raised patterns are called brocades. Gold or silver cloth, i.e., silk woven with gold or silver thread are known in India by the name of kinkhabs (kincob). Silk brocades are made wherever silken stuffs are manufactured on an extensive scale. Murshidabad, Benares, Ahmedabad, Surat, Multan, Poona and Aurangabad are the places most noted for silk brocades. Benares saris still maintain their old reputation; but it is the fabric with gold and silver flowers that is mostly sought after. The Bengali ladies are very fond of those saris and there is a considerable demand for them throughout this province. Gold and silver embroidery is chiefly applied to caps and to the trappings of horses and elephants. 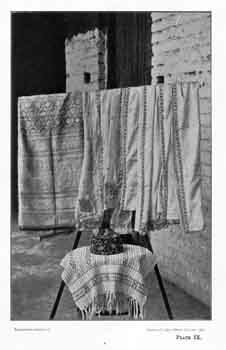 Murshidabad and Patna have several skilled embroiderers, and there are altogether about 1,000 men engaged in this work in the latter town. Gold and silver wire (Kallabatoon) is made in Patna and Murshidabad in small quantities, but most of the gold thread comes from Benares and the North-Western Provinces. Gold and silver wires are used in lacemaking, lace ribbons, borders and edgings for Indian use and are known as Gota, Kinara and Anchal respectively. They are of various breadth and patterns and are woven in a tiny loom with silk thread for the warp and gold and silver for the woof, or vice versa. Dacca, Murshidabad, Patna, Benares are the principal centres of the Indian lace manufactures. 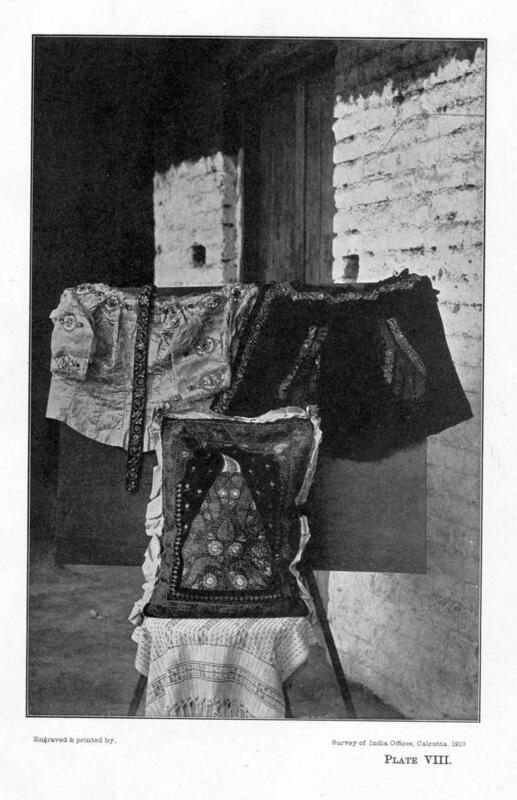 Gota and Kinaraare chiefly used as borders for female garments. Amongst the rich gold woven ribbons called seerpech are worn on the head by bridegrooms, as also plumes made of finely cut silver leaf. The distinction of wearing seerpech belongs by right to the king, but as in the East the bridegroom is considered the king of that day, he is allowed to bedeck himself with royal robes. The topore or cone-shaped pith hat decorated with tinsel is, however, invariably used on marriage occasions. 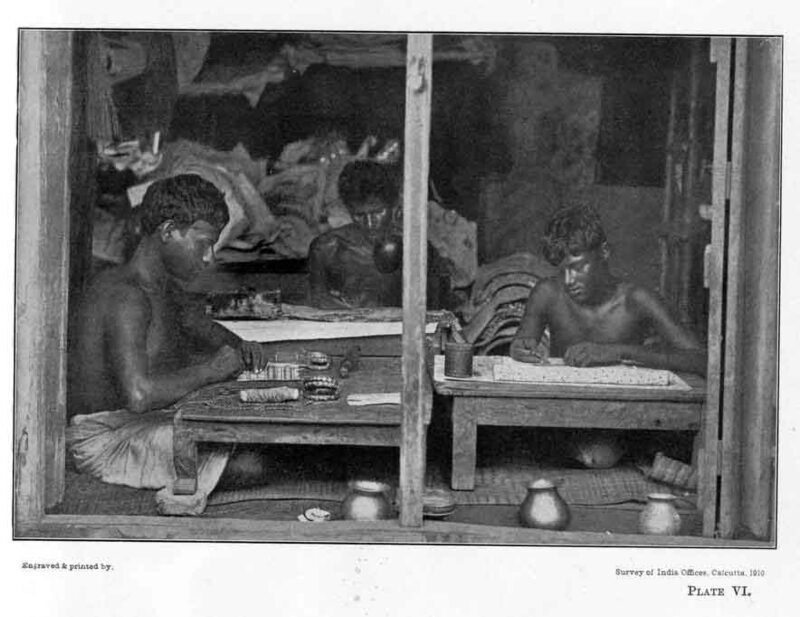 The preparation of the topore is a monopoly of the malakars. 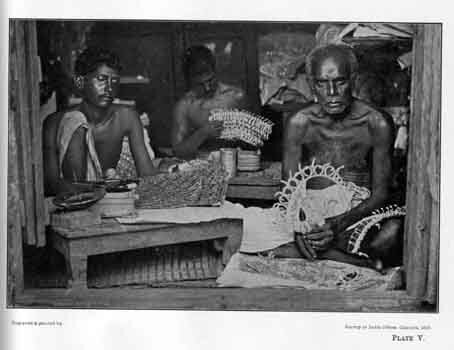 A costly dress for the bridegroom had been purchased; the village malakar was ordered to prepare as gaudy a crown as he could make, for all Bengali bridegrooms, however poor, put on tinsel crowns at the wedding; equally gaudy shoes, embroidered with silver, had been brought up from Calcutta." The hooka-pipes called shutka are invariably adorned with gold and silver wires. Kallabatoon and laces are used for the costly pipes and false (jhuta) lace is used for the common ones. The pipes called "snakes" by the old Anglo-Indians are manufactured in all the large towns in Upper India. Silver and gold tinsel prints on coloured cloth (saries) are made in some places. These gay clothes are worn specially by women of the poorer class on festive days, e.g., at weddings and tamashas. Imitation gold and silver leaves are at present not prepared in Calcutta. It is said that there was a factory at Maniktala, which went into liquidation and was purchased by the shajwallahs (image-decorators) of Kumartuli. They could not work it satisfactorily, as they could not compete with the machine-made foreign goods which were far cheaper; and hence it failed. Pure gold and silver leaves are, however, prepared at Chitpore. There are four shops. Nazir Hossain, of Patna, who holds a shop at 88, Lower Chitpur Road, is an expert. He has a workman named Mahamed Taki who is a good worker. He earns Rs. 20 a month. The preparation of these leaves is interesting. Sheets of gold or silver are first prepared. One tola of gold sheet is then cut into 160 pieces and silver sheet into 140 pieces. There are leather cases (6" X 4") containing 140 or 160 as the case may be, made of dried jhilli or membrane of deer. Pieces of gold or silver are thus placed between two dried membranes, and the cases thus filled up are treated in the following way instead of putting them under a hot press. The leather cases are hammered for a long time on a slab of stone till the foils measure 4" X 5". There is no chance of any injury while they remain packed between the two layers of deer membrane. One hundred and sixty leaves of gold, weighing one tola, are sold at Rs.28 and 140 silver leaves of the same weight at Re. 1-8. Like many indigenous industries the "wire and tinsel" industry has now deteriorated. The compiler of the Patna District Gazetteer remarks: "Nowhere is the decline of Patna as a manufactory centre more noticeable than in the matter of hand industries. Practically every kind of industry is carried on; but none of them are of special importance or extent, and few of the products are exported." Some families made this industry a hereditary occupation, but their number is gradually decreasing. The people themselves ascribe their fall from their former state to want of encouragement, their idea of encouragement being that intending purchasers should place orders and make them advances on account before they take the work in hand. Whether this idea is due to poverty or to want of enterprise, it is difficult to say with certainty; probably it is due to both. Certain it is, that there is no likelihood of the local industry regaining its lost position; for intending buyers can obtain their requirements from Benares where ready made articles are stocked, and the finish of the work is much superior. The outturn of the Patna district is small and export is confined to Bihar. About 33 years ago this industry was in a very flourishing condition in Calcutta. There were about 9 big shops at Machuabazar, each shop having 20 to 25 expert workmen, and each of those workmen used to earn Rs. 2 to Rs. 5 a day. In or about the year 1877, a German manufacturer came to Calcutta and took away samples of each of these products. The next year after that machine-made articles were imported from Germany. Though the price of the German produce was much less than that of the Calcutta produce, still the industry in Calcutta thrived till 1897 because the finish of the German articles was not so good as that of home-made ones. In 1897 very fine and well-finished machine-made articles were imported from Germany; the skilled hand labour of the native workmen could not cope with the machine-made articles; and hence within a very short time the whole native industry has almost ceased to exist. There are at present only three shops at Machuabazar. Sheik Kalu has a shop at 133, Machuabazar Street, and he is an old expert in the art. He has only one expert workman, named Moshaheb Ali. These workmen, however, find very little work for them. There is no longer that demand for fine country-made wires, but as the imitation silver spangles of Germany are not highly polished nor of good finish, there is still some demand for chumki (spangles), and hence these three shops eke out a miserable existence. The German goods have thus displaced to a great extent the country produce. 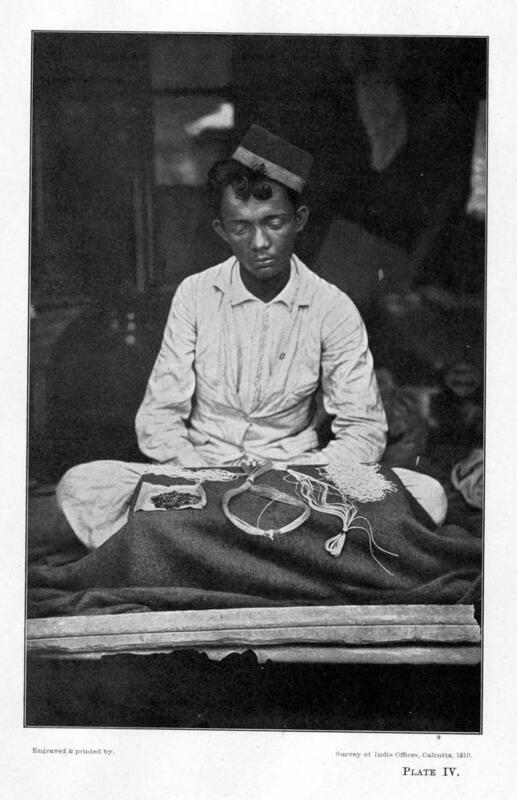 "A proof of the superiority of the Indian over the European gold and silver wire as usually manufactured, was afforded at the Dublin Exhibition a few years ago (prior to 1887), during the progress of which the chief exhibitors of the Irish poplins in which gold and silver thread was used, had to change their specimens on account of becoming tarnished; whereas the metal embroidered fabrics of India, shown on the same occasion, retained their colour and lustre throughout." Indian Art Journal. B. S. Press  3-5 19102794J  600  T. N. R.
Plate IV. Exhibiting chumki, khankni, bullion, salma. Plate V. Image decorators at work - preparing anchla and mookoot.